Image Consulting can be best understood by relating it to the profession of an Interior Designer. An interior designer brings the elements of Carpentry, Electricals, Plumbing, Masonry, Painting, Furniture, Fittings and Furnishings together in a harmonized fashion to give a complete look to a house or an office. Now, most of these elements have existed long before Interior Design became a major profession. Before that, one would hire a skilled person in each separate element to complete the interiors of a house or office and in most cases did not get desired results as the elements clashed. The hired persons did not have knowledge about the other elements. The end result does not necessarily depend upon each element performing its best, but it depends upon all the elements coming together to create a balanced, harmonious look. This coordination of elements is the role of an interior Designer. And, not only the elements are harmonized together, but while doing so, the client’s authentic personal style, appropriateness, attraction and budget is kept in mind. 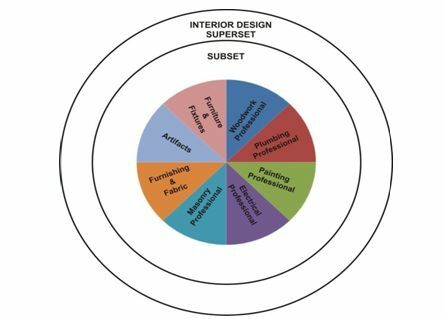 So an Interior Designer becomes the super set of a sub set already existing which is shown in the chart below. Similarly an Image Consultant coordinates all the elements that create the right image in a harmonious way to give the desired results to the client, while keeping in mind the client’s authentic personal style, appropriateness to their goals and roles, attraction and budget. 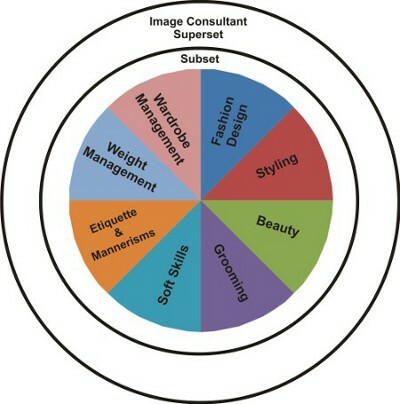 Individual elements of image consulting have existed for many years and an image consultant brings them together and thus becomes a super set to the sub set existing already as shown in the chart below.